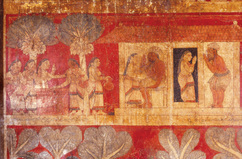 This scene at the Degaldoruva Vihare in the Kandy district, Sri Lanka, is somewhat restrained, but is presented together with a group of women round a well, whose taunts provoke the young woman Amittatapa (Vessantara Jataka, one of the former birth stories of the Buddha) to assert herself. Although these paintings are only a visual expression of earlier literary woks, the choice of episodes and the manner in which they are presented may reveal 18th century attitudes. 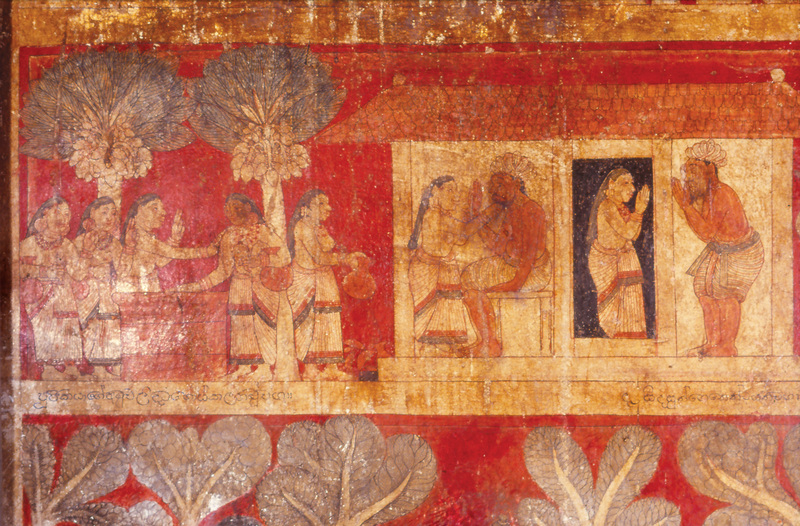 Sirima Kiribamune, "A painting on a temple wall, of a woman asserting herself over her aged husband," online in Digital Library for International Research Archive, Item #12655, http://www.dlir.org/archive/items/show/12655 (accessed April 18, 2019).